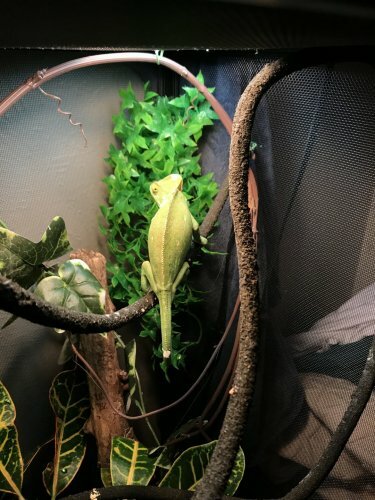 - Type: Her cage is a Zoo med reptibreeze we got the chameleon kit with mesh screen. We are currently about to upgrade to a taller, homemade enclosure. Current Problem: When we got her we believed her to be gravid. We placed a laying bin in her cage but she never went into it. 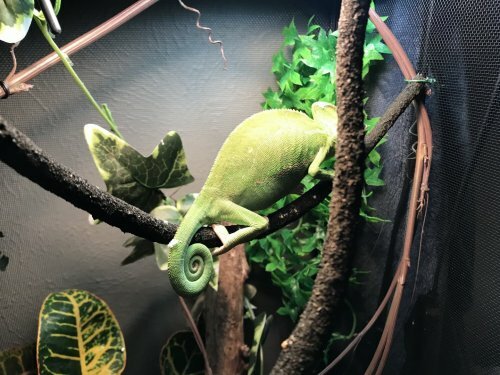 She is extremely active moving all over her cage all the time and almost always vibrant green. After having the lay bin in for a the first month we took it out to allow her more space to roam up and down. Now she has started to spot yellow on her and I have heard this is a receptive color. I placed her laying bin back in her cage and also covered the sides of the cage so that she has no distractions or stressers. I am just really worried about egg binding as of now we have had her for two months and she hasnt laid anything and today she got yellow colors. 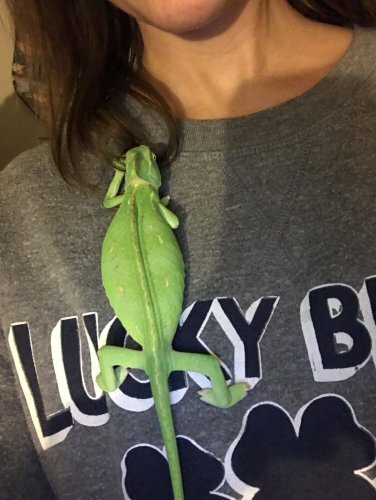 I just want to get an opinion on what could be going/ why she hasnt laid/ is it possible for her to have not been gravid when we got her and she was just a chunky gal? I am going to upload pictures of when we got her vs. how she is now. Please help! Cant hurt to take her for a vet check up to confirm she is gravid. Are you dusting calcium with D3? Without D3 she will not be able to process and use the calcium for her bones or eggs. The coil UVB isn't going to benefit her much in terms of her naturally producing D3. You'll need to upgrade the UVB light to a linear T5HO or T8 for long term health. Transport her in a cardboard box with a hand towel in the bottom and a stick or branch for her to hold onto. The darkness in the box will cause her to go to sleep so there is virtually no stress involved. There are three main supplements you need. Plain calcium with NO D3 for daily use, calcium with D3 is used twice per month and a multivitamin is used twice per month. It is crucial you do not supplement D3 more than twice per month with most brands of supplement since the chameleon can essentially over dose on D3. Arcadia brand T5HO UVB bulbs are my personal recommendation. Lightyourreptiles.com has a great selection of fixtures and kits. The reason we recommend switching to a linear style bulb is due to how the UVB light is spread throughout the cage. 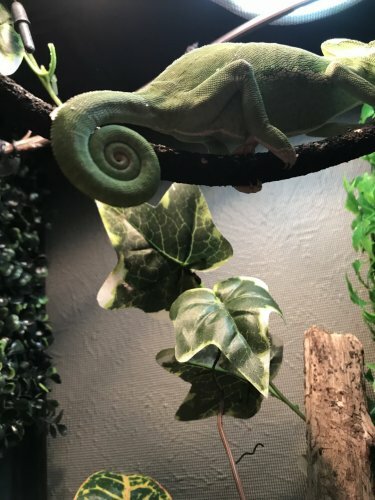 Coil bulbs focus the UVB in one small area so the chameleon has to be directly under the light to get any beneficial UVB from it. Linear bulbs extend across the whole width of the enclosure so the chameleon doesnt have to be in one spot to get the UVB it needs. Update! 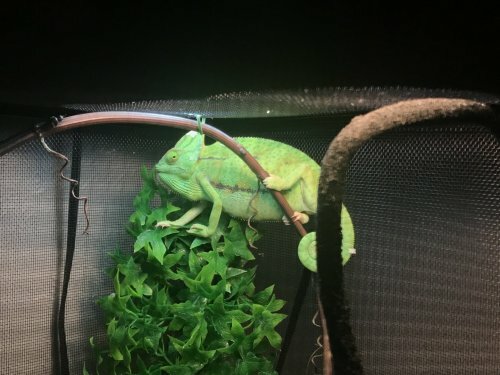 As of today we have 28 eggs and one happy Cham!